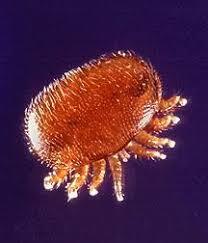 The varroa mite is an external parasitic mite that attacks the honey bees. The disease caused by the mite is called varroosis. The varroa mite can only reproduce in a honey bee colony. It attaches to the body of the bee and weakens the bee by sucking fat bodies. In this process, RNA viruses such as the deformed wing virus spread to bees. A significant mite infestation will lead to the death of a honey bee colony, usually in the late autumn through early spring. The varroa mite is the parasite with the most pronounced economic impact on the beekeeping industry. Varroa is considered to be one of the multiple stress factors contributing to the higher levels of bee losses around the world.